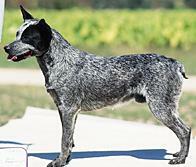 The Stumpy Tail Cattle Dog breed began evolving in the early 1830s because of the need for a dog that could work cattle in Australia's very harsh environment. The breed that we see today is the result of many years of careful thought and selective breeding by dedicated people. Three breeds of dog went into the making of the "Stumpy". First there was the crossing of the Dingo with an English breed of dog called the Smithfield (these dogs were naturally bob-tailed) which is where the gene comes from that is still present in the Stumpy today. Then the progeny from these matings were crossed with the smooth coated blue merle Collie (commonly referred to today as the German Coolie) and so a breed of dog was born that cattlemen, then and today, swear is the best working dog in the world. 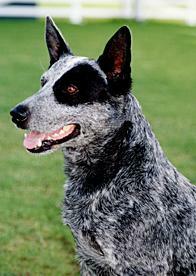 Stumpy Tail Cattle Dogs can live up to 15 years of age. The Stumpy is a loyal, courageous and devoted animal that possesses natural aptitude in the working and control of cattle. It is suspicious of strangers and will protect its family and possessions with its life. It is not an aggressive dog but if pushed will not back down without a fight. The Stumpy will get along with other animals in a household as long as they are introduced slowly and without tension. The best way to do this is by allowing animals to see and smell each other through a wire fence for a few weeks, until they realise that they pose no threat to each other. Even though the Stumpy is a working dog, it does well in a suburban household as long as its exercise requirements (and need for mental stimulation) are met. Obedience training with the Stumpy is a necessity as its intelligence needs harnessing, so that it doesn't dream up activities for itself - such as digging tunnels, pulling washing from the line, pruning trees, and jumping fences! The Stumpy can be very vocal at times, so from the outset the dog should be taught that barking is not allowed, unless there really is something to bark about. And while not usually a fence jumper, it can be quite an accomplished hurdler when it wants, so if you have low fences a dog pen may need to be built for those times when you won't be home. The ideal owner for the Stumpy should be someone who appreciates an active dog. While these dogs adore children, they should not be left together unsupervised. Elderly people may find the Stumpy a bit of a handful.